NRI means a person who works or stays outside India more than 181 days. My one of the friend has recently got H1B visa and he is flying to the USA. If he stays in the USA for next 181 days he will get NRI status. He approached me with following questions. What should he do about his bank account before leaving India? What should he do for the existing fixed deposit? What to do about existing Mutual Fund and Stock holding? What to do with PPF and Sukanya Samriddhi Account? I solved his confusion by answering his questions. If you are also leaving India, it is better to complete certain important financial tasks before you board the plane and bid adieu to your loved ones. So, here is simple to do list for NRI leaving India. As per RBI guideline, it is mandatory to convert your existing account to NRO, if you are planning to leave India or becoming NRI. So, the first task for you is to change your existing account to NRO account. NRO account is known as NonResident Ordinary account. You can only keep money earned in India in the rupee form in this account. NRO is like normal saving bank account only except resident status and tax treatment. Normal saving bank interest rate 4-6% is applicable on NRO account. However, Tax treatment of NRO account is different as TDS applicable in this account is 30.9%. Apart from this bank need to report all transaction detail of this account to RBI. The maximum limit of this account is 1 Million USD. The balances in NRO accounts cannot be repatriated without the prior approval of RBI. In order to convert the status of your existing account to NRO account, you need to submit passport, visa proof, work permit and declaration letter to the bank. On submission of these documents, the bank will convert your bank account into NRO account. This change is also possible after you leave the country, however, you need to send a notarized copy of all the mentioned documents to the bank. This will be time-consuming and tedious exercise. The second task you should do is to open NRE account. NRE account is known as Non Resident External Saving account. You can deposit your foreign income earned outside India in this account. The balance maintained in this account is in rupee form and it is freely repatriable. The interest income and balance of this account is exempted from the tax. You can open NRE account by filling up form and submitting required documents including work permit or visa proof. You can also open this account at the later stage. However, it becomes difficult remotely to open this account. NRE account can be opened in the form of Saving, current, recurring or fixed deposit accounts. Fixed deposit is one of the favorite investment options for the Indian and I am sure you must be having it. So, a task for you before leaving India is converting this fixed deposit to NRO. Some of the banks automatically convert existing fixed deposit to NRO once you submit a request for changing your saving bank account. However, for some banks, you need to apply separately to convert this fixed deposit to NRO. The interest rate applicable on NRO fixed deposit is kind of same but the interest earned will be taxed at 30.9%. I am sure you must be holding stocks in your Demat account. So, next task for you is to close the Demat account and open PIS account (Portfolio Investment Scheme) because as per RBI NRI can invest in shares and convertible debentures of Indian companies listed on NSE/BSE under the Portfolio Investment Scheme (PIS) route only. Under PIS route, NRI is permitted to invest up to a maximum of 5% of the paid-up share capital of the Indian company. If you are NRI you need to open PIS account linked with NRO or NRE account for trading in stock market. If you are holding share in Demat account after becoming NRI it is considered as illegal. You need to transfer your existing stocks into PIS account. PPF and Sukanya Samriddhi Account are best small saving account for Indians. As per RBI, NRI cannot open PPF account. However, they can continue old PPF account. So next task for you is to open PPF account if you really want to take advantage of high-interest rate of PPF. Along with that if you are holding Sukanya Samriddhi Account time has come to close the account as NRI is not allowed to open or continue Sukanya Samriddhi Account. Next task is to identify the most trusted person and make a power of attorney on his/her name. The power of attorney holder can do any financial transactions on behalf of you in your absence. He/she can operate your bank account, sell/purchase share, sell your property etc. So, it is advisable to choose the person carefully. As per me, you can select your close relative like mother, father, brother or sister for this. There are two types of power of attorney (i) General power of attorney (ii) Specific power of attorney. Select one based on your requirement. It is good to consult a legal advisor for making PoA. If you have not taken Internet banking username and password, time has come to take it. Before leaving India you should contact your bank to avail this facility. This facility will allow you to operate and view a status of your account anywhere from the Internet. If you are going to discontinue your Indian number, it is good to change the mobile number mentioned in the bank account. This is required especially when you need to enter OTP (one-time password) for performing banking transaction as OTP is generated and sent to register mobile number only. You can give mobile number of your close relative or friend. As per KYC norms of RBI, it is mandatory to inform status change or change of residence to respective authority. You should update your KYC status to continue your mutual fund investment, because once your saving bank account is converted in NRO/NRE account next ECS instruction for the SIP will be not executed if fresh KYC is not given. Even selling of fund is also not possible if KYC is not done. KYC also require IPV (in person verification) so it will be difficult to do KYC when you are not in India. I am sure you must have purchased good term plan with sufficient coverage. However, if you have yet not purchase it next task for you is purchase a suitable term plan. In some country purchasing insurance policy might be costly. If you are already holding term plan or insurance policy, you should inform Insurer about your NRI status change. Health is wealth and you must protect your wealth i.e Health. If you have not purchased health insurance policy yet you must opt for suitable health insurance policy. Health insurance will help you to cover growing health care expenses. After becoming NRI, it will be a hassle for you to visit India for health checkup fulfilling a mandatory requirement for taking health insurance. The next task for you before becoming NRI or leaving India is to close your home loan, personal loan, car loan etc. It is not like that you cannot keep loan pending once you become NRI, but if it is good to close the loan to avoid unnecessary hassle of documentation, NOC at the later stage. Before leaving India it is a good idea to gather all your financial documents convert it in e-copy and store a password protected soft copy at a suitable place. This will help you in quickly locating the documents as and when required. It is advisable to keep one person as a joint account holder in the bank account. Your joint account holder can operate your bank account in your absence if required. You must be holding a locker in the bank. So, next task for you before leaving India is to close your locker or add joint holder in the locker. You must be aware that It is mandatory for the holder to operate locker once in the six-month else bank has a right to break the locker. Once you become NRI it won’t be possible for you to operate locker every six months. You should make sure that there are no pending tax liabilities on your head. If you have any due on tax make sure you to clear it, in order to avoid hassle at later stage. You will need foreign currency. So, next task for you is contact the bank or exchanger and convert the rupee you have in to suitable foreign currency. This will help you a lot at an initial stage. You should take a suitable credit card allowing international transactions. International credit cards are more secured as it is smart chip enabled. This credit card will bring additional helping hand at an initial stage. This to do list is prepared based on research and experience I have. 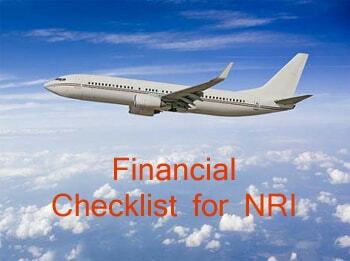 Hope this to do list for NRI will help you. If I missed anything do let me know by comment section so that it can be added. As said earlier for NRI person staying abroad 181 days have to do anything with finical year as this is a in complete statement. Also he would have to Pay Incom Tax working abroad and fails to fall on becoming an NRI. If income earned in India cross the tax free limit for the financial year he/she need to pay tax.Tax is not aplicable for income earned outside India.